A standard heat press or cap press is a perfect solution for decorating basic items like shirts, caps, and mouse pads. The heat press sandwiches the item between the platen and the table applying even pressure and heat to the item being decorated. When all goes well, your vinyl graphics, dye sublimation or laser transfers are permanently fused to the fabric. But what happens when life throws you a wrinkle in the form of a shirt with buttons or seams near the target area? Or a cap that’s a little too big for the cap press? How do you get rid of those pesky lines the heat press leaves on polyester shirts? Stuff it with a nomex pad. Lines on apparel left by the edge of the heat press are a common nuisance. These are caused by the sharp difference in pressure along the edges of the heating element. This is especially true of soft polyester garments popular for sublimation. Buttons, zippers, and seams pose are a bigger challenge. Pressing transfers over seams and around buttons, zippers, and pockets is a little like trying to put a round peg into a square hole. You’re tying to apply even pressure to an uneven surface. You can’t change the shape of the heating element and make it mold to the shirt, but you can change the surface of the table and make the shirt mold into the heating element. This is done by adding a cushion under the garment that turns the relatively stiff rubber pad into a more forgiving surface. The effect is to raise the surface of the fabric to produce even pressure against the heating element. So how do you raise the fabric to fill in around those pesky seams, zippers and buttons? You stuff that shirt with a nomex pad. There are various approaches to the problem, but they’re all variations on the same basic idea. Some people use pads, some use pillows. We offer Geo Knight Nomex pads in two convenient standard sizes. The 14″ x 16″ size is a perfect match for the DC Combo. The larger 16″ x 20″ pad is great for use with all 16 x 20 heat presses, including the EnduraPRESS SD20. Prices start at $40.00. Don’t worry, they’re reusable. Here’s how they work. Using a nomex pad is easy. Just place it inside or under the item to be decorated. If your heat press supports threading garments, the best way to use a nomex pad is to place it on the heat press table, then thread the garment over it. If there is no space under the table on your heat press, just place the nomex pad on the table and lay the garment on top of it, taking care to avoid wrinkles. In either case, placing the pad under the fabric lifts and cushions the apparel. Now you’ve made the item softer so that the heat press will press the buttons into the pad. But you’ve also made it significantly thicker. Because of the fulcrum effect produced by thicker items on a heat press, you’ll need to reduce the pressure setting on your heat press. Then test it at a low temperature and readjust until you have enough pressure to push the apparel down into the pad, but not so much that you can’t close the press. What if you want to thread the garment, but the pad is too large for the shirt? This can happen if you’re decorating children’s apparel, or just a sleeve or pant leg. There are a couple approaches to this problem. You can cut the nomex pad to fit inside the shirt, and/or use a custom table made for smaller garments. Cutting a Geo Knight nomex pad is pretty easy with a good pair of scissors (Fig 1). 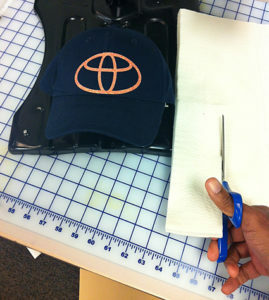 To use a nomex pad for under-filling the front of a cap, just cut a piece of the pad to fit inside the crown of the cap. 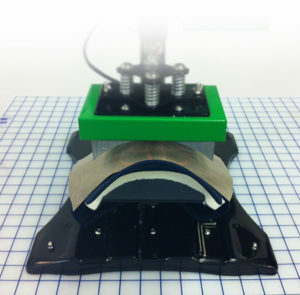 Place the pad on the curved table and cover the cap with a piece of a Teflon sheet. It helps to cut off a piece of Teflon to fit. Now you’re all set. The nomex pad will raise the crown so you can get even pressure around the front seam to apply your transfer. This is also a good solution for pressing a cap that’s just too big for your cap press. The next time you need to sublimate a soft polyester shirt, or apply t-shirt vinyl over seams, zippers or buttons, remember to stuff it first. Underfill it with a handy dandy nomex pad. You can cut them to size and reuse them for caps and sleeves. With a nomex pad and a pair of scissors, you can turn those seamed, buttoned and zippered garments into professionally decorated custom apparel.